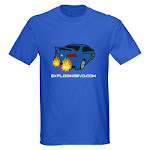 Exploding Evo: It's a never ending cycle. In anticipation of tomorrows and future upgrades, I just received an Innovate LC-1 wideband. I'll do the installation this weekend with a couple friends and test it out :) As far as other gauges go I've been told boost, oil pressure and temperature. I'd really love to just install a screen where the stereo is and run digital gauges for all that on a centralized computer. There was a company that did this (featured in "The Fast and the Furious in Paul Walkers R34 at the beginning), but they've gone bust. I want the R35 GT-R display! I wonder what it'd take to produce a product like that. I've got the same setup in the eclipse and love that display.